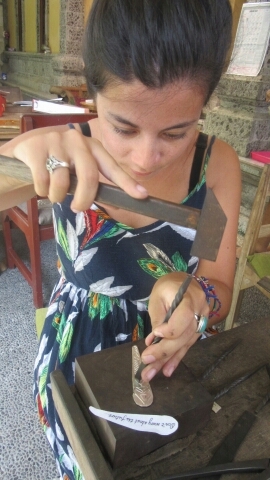 Hop around with me for massage, Silver making, meditation in Ubud – Where's Walton? If you read a previous blog, you’ll ever know I had an incident with a cow and a scooter in Lombok. Well have you ever had a flesh wound? It’s really insignificant and it usually scabs over in a few days. But ever had a flesh wound on a joint or on your foot? It’s not pleasant or comfortable as every time you move the wound splits again and again 😦 it’s really attractive. 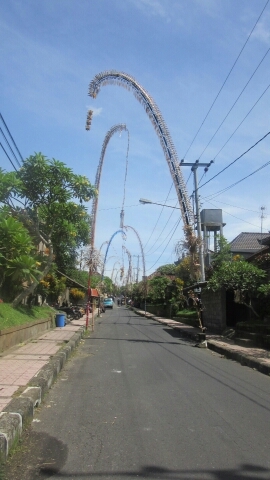 So here I am in Ubud, hopping and hobbling the beautiful streets of jewellery stores, massage parlours, cafés, book stores and more. There’s a really nice vibe to the place, completely aimed at tourists but I do really love the town. 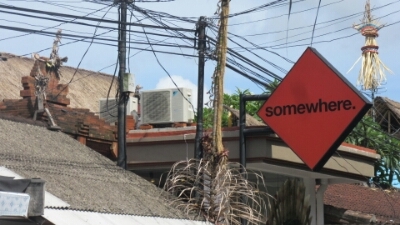 We’re also wham bam smack in the middle of Ubud Market by staying at Sania’s House and it’s so nice to finally be able to be in a place where I can step out of my accommodation and walk about and not need a bike. Much safer! Everything here is walking distance although you do get asked if you need a taxi every 20 seconds. 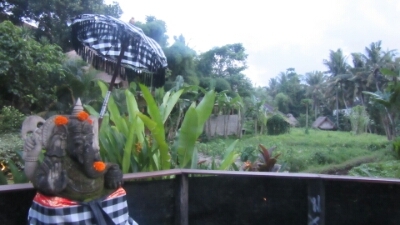 One of my key reasons for coming to Ubud was Yoga but unfortunately with my foot stretching and putting pressure on my foot is not an option. 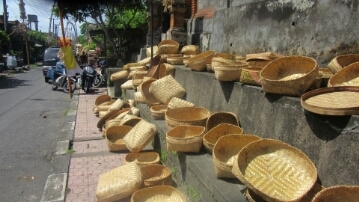 So what else is there to do in Ubud? Plenty! Explore! 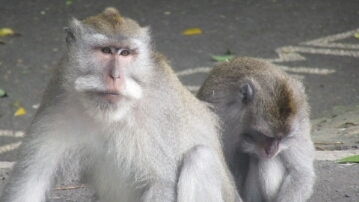 Monkey Forests, meditation (one of the tick points on the travel bucket list), jewellery making and art classes, eat lots of food, the market and more. I’ll just need to hobble from one to the next. So on day one, as planned Steven and I went for a traditional Balinese massage. It was one hour for 65,000 (£3.25). Now I’m so glad I made it clear to the masseuses that we are NOT a couple therefore we need separate rooms. I’m so glad I did because as soon as my back was done the lady had whipped off my bra, turned me on my back and I had no idea where her hands were going to go. So it’s hard to keep a straight face especially when the music is a mixture of Indonesian and an Irish jig. For food we ate at Biah Biah – the food was incredibly cheap and the restaurant and service was really nice for the price. My meal cost a mere 19,000 (less than a pound) and I discovered something new… which is Balinese Rice wine. Three glasses later I was in love. We ended the evening at The Laughing Buddha for live music. 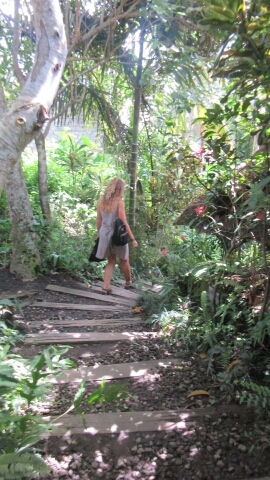 There’s no clubs in Ubud which is very refreshing and keeps in line with the ‘vibe’ of Ubud. The city closes early so don’t expect to find many places serving food past 9pm. The following day Gill and Steven were off for Yoga at the well-known Yoga Barn. 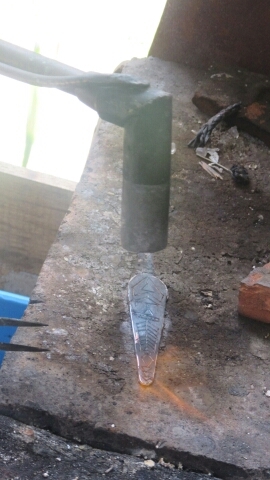 Due to my foot, I opted for a Silver making class instead. I was really keen to make something symbolic of my travels as a keepsake. 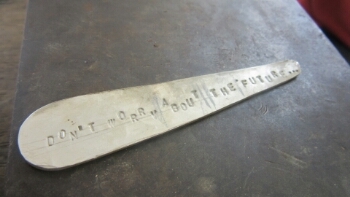 There’s a quote that has stayed with me all through my travels so far since my buddist tour guide in Chengdu China wrote it my book: “Forget the past, don’t worry about the future.” I believe there are only 2/3 classes in Ubud and you roughly get 5-10 grams of silver along with support in a workshop for 400,000 (£20). My class was with Chez Monique a 5/10min walk away from town. It was recommended to me by Gill but has very high reviews on Trip Advisor. 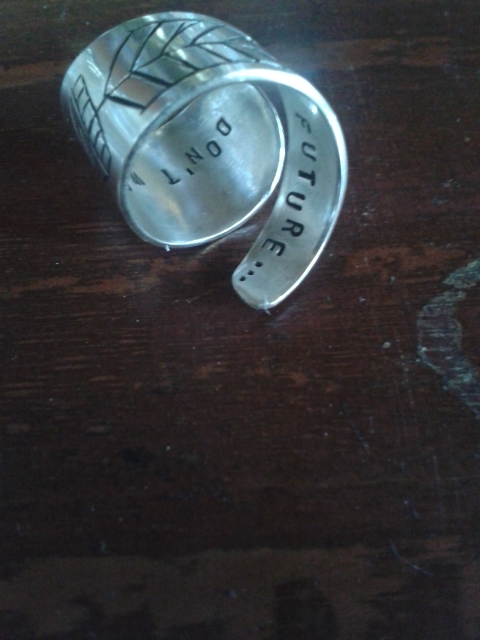 I had such a good afternoon and spent a total of 5 hours designing and making a ring. 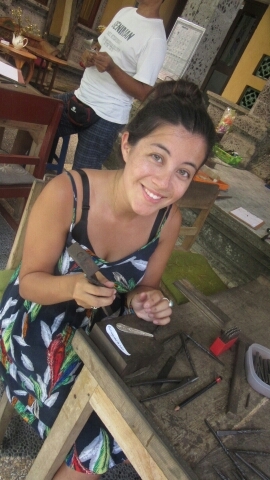 It made me appreciate how much work goes into jewellery making. During my class I met an art teacher (my favourite kind of teacher) from Australia called Geraldine. She had a lot of advice for Melbourne next month and helped me think through the concept of my ring as I was really over thinking it. 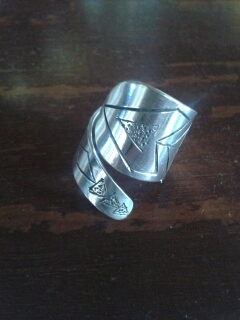 I knew I wanted to design a ring that twisted around my finger. 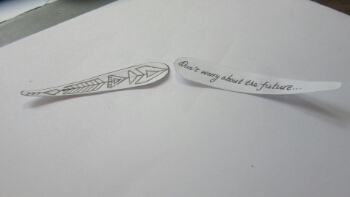 Underneath would be a quote and on top a design symbolic to travel. For 2 hours I sketched compasses, globes, suitcases etc but in the end I was drawing arrows pointing in opposite directions. And once the ring was made it was such a nice feeling knowing that I had a one of a kind ring personal to me. The classes at Yoga Barn are 120,000 (£6) a session. There are about 12 sessions a day and fit about 42 students or ‘Yogi’s’ as they call us. You can buy classes in bulk to save money but I reckon they making a killing as no locals do this. Now I’m a big thinker so I was skeptical on how I would be in a meditation class. I once went to a hypnotherapy session where I had to stop the man 15 minutes in as I personally found it a bit ridiculous. But Yoga Nigra was a really cool experience. The teacher was a lovely lady called Gypsy and her one rule was that all phones needed to be on Airplane mode – no 3G waves in the studio. Yoga Nigra state between being awake and asleep and in this state I went on a enlightening journey of flying through doors in space through the stars and another part of me was hovering and dancing over my sleeping body. This session was supposed to be an hour long, but there was half hour initially of an introduction and stretching, an hour of meditation and then as long as we needed afterwards to reflect on the class. Nameste! It’s always great to get your monies worth. Tomorrow we have a family day out in a rented car. I’ll let you know how it goes! 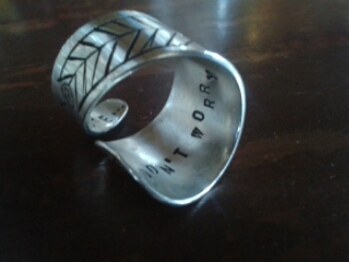 Silversmithing seems to be your thing….the ring looks brilliant! 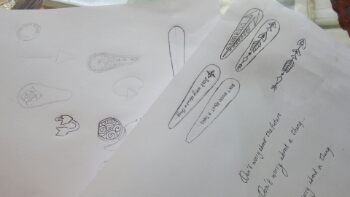 A new career in jewellery design?? ?